Today is Veteran’s Day. For most of us it represents a holiday: a day without the responsibilities of work, a day to spend with family or friends. But it is, really, so much more. In a time when our nation is at war in Afghanistan, and when our soldiers are being killed in action, or returning home with serious physical and mental injuries, it is important to honor their service. We must also respect the sacrifices they have made for us and to always, always remember the human cost of our countries decision to go to war. As a result, Veteran’s Day is, and should remain, a day of reflection, a day of sadness and a day of loss. The memories of each war are different. The few remaining veterans of World War II have a different experience than those of the Gulf War, the Korean War and every other war of our time. To fully understand Veteran’s Day you must, almost necessarily, have served in the military or been close to someone who has served. Kansas City’s Vietnam War Memorial, located at 43rd and Baltimore, is dedicated to the men and women who lost their lives in the Vietnam War. The memorial wall includes the names of 385 Kansas City area servicemen who lost their lives during that war. This wall is personal to many Kansas City residents. For me, the name John Igert says it all. Johnny was a friend, a classmate and a casualty of the war. He graduated from William Chrisman High School in 1964, and attended Central Missouri State College, in Warrensburg, Mo., before entering the military in 1967. He died in Gia Dinh, Vietnam, on August 17, 1968, just three months after he should have graduated from college. He was only 22. He was an easy person to know. He was fun, he was a good man, though only barely a man when he began his military service–and when he died. 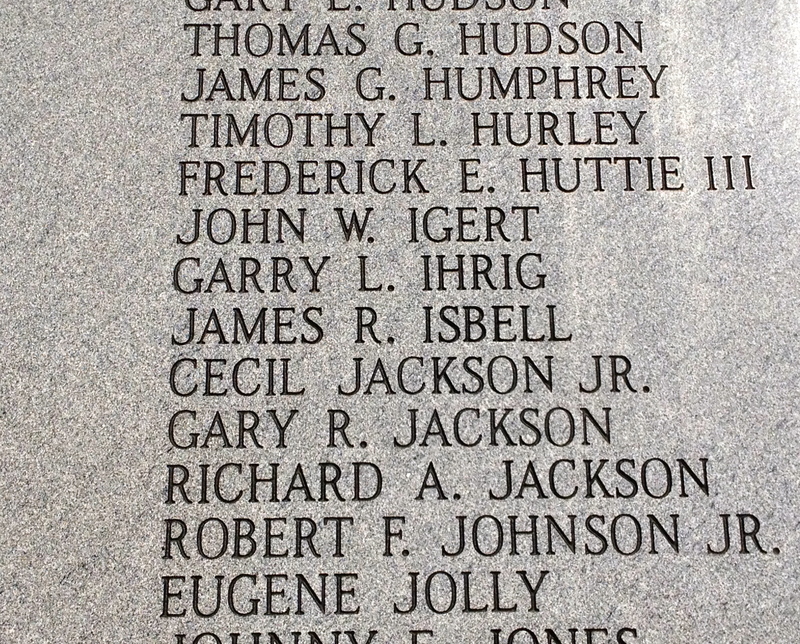 Each of the 385 servicemen whose names are carved in the granite of the monument has a similar story. Each name represents someone who is remembered by family and friends, who loved him when he was alive, and love him still. Each name represents a life lost. Kansas City’s Vietnam War Memorial honors our soldiers who fought, died and missing in action. The memorial acknowledges that the war deeply divided our country and that in the middle of the dispute were the men and women who fought and died in the war. The memorial is based on a series of pools and fountains. The separation of the pools is designed to acknowledge the deep divisions within the country over the war. 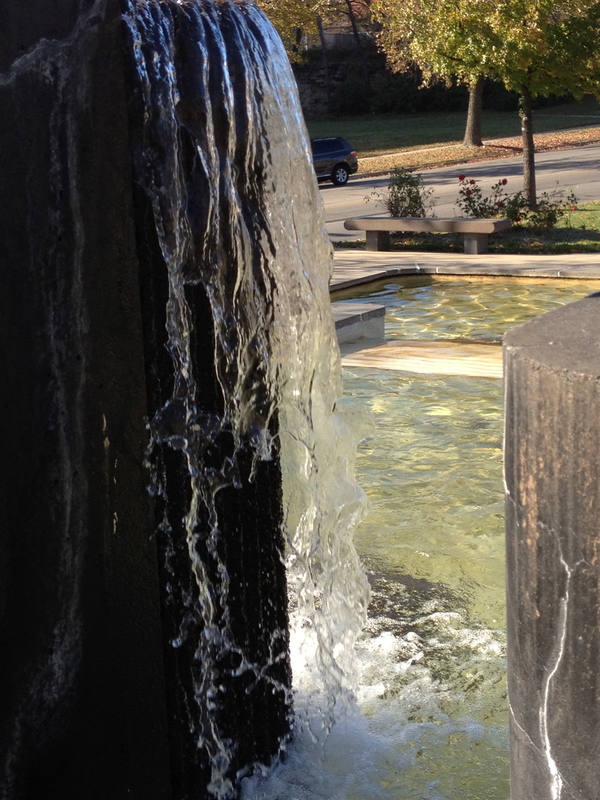 The fountains represent the healing and cleansing power of water in restoring our national spirit. The words on the granite summarize a message of hope. “Only by remembering can we assure it never happens again”. Wishful thinking? Repeatedly. But the message of hope sustains us and causes us to search for better solutions to the challenges of our times. This entry was posted in Social and Economic Issues and tagged John Igert, kansas city, Kansas City Fountains, Veteran's Day, Vietnam Memorial, War Memorial. Bookmark the permalink. I did not know about the war memorial. I will make a point of visiting it and honoring those who served. Thank you.